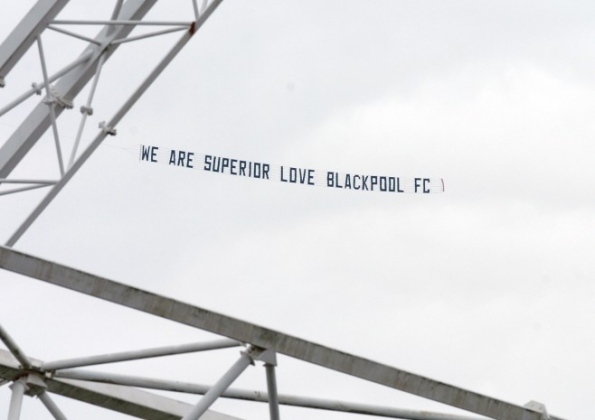 A group of Blackpool fans are set to be investigated by the Civil Aviation Authorities (CAA) after hiring a plane to fly banners over Deepdale stadium to taunt local rivals Preston on being relegated to League One. The plane trailed two banners over the ground during Preston’s 3-1 win over Watford on Saturday, reading: ‘Poor little Preston enjoy League One’ and ‘We are superior love Blackpool FC’ – with North End manager Phil Brown later declaring the jibe to be ‘distasteful’ and adding that ‘if he’d had a gun, he’d have shot it down’. The prank is though to be Blackpool’s long-overdue comeback for the banners which Preston fans hung from the bridge on the M55 (a bridge that many Seasiders fans had to pass under while travelling to watch their side in last year’s playoff final) which read ‘forever in our shadow’. Any road up, the CAA have stepped in over fears that the plane breached regulations about flying at low altitudes over built-up areas – the bloody killjoys. Preston fans dont like the taste of their own medicine. Shame.